Dan & I met and fell in love whilst travelling around South America in late 2013. A few months later I said goodbye to Australia with a one way ticket to London, a UK working visa and almost 50 kg of luggage (thank you Emirates for your generous baggage limits). It was like a fairytale and I had also always wanted to move to the UK but being from opposite sides of the world meant we had to discuss fairly early on where we wanted to end up if our relationship was to work! We discussed it a lot earlier than most couples I’m sure but decided that ultimately Australia was where we wanted to settle. We were lucky enough to apply for Dan’s partner visa from the UK and have it approved in just over six months and so we wanted to share our visa story in the hope it assists others who are going through the same experience. We regularly discussed our future and early on decided that following my two year working visa in the UK we would hopefully move to Australia. Whilst the UK is a great place to live and it’s been wonderful to get to know Dan’s family and friends and see where he grew up, I truly think Australia is the luckiest country in the world and we can’t wait to start our lives there together. We submitted our application in May 2015 which was a few weeks after we were eligible to apply (meaning we had been in a de facto relationship for 12 months). When we applied we received an automated confirmation that our application had been submitted which advised us the wait would be 10-14 months for the visa! So you can imagine our surprise when late one Friday afternoon at work in December I received an email with our visa grant notice (6-8 months early)! We were extremely lucky because our visa was approved in just over 6 months and I think one of the main reasons was in the quality of our application and the strength of the evidence we provided. A lot of champagne was consumed that weekend as we had good reason to celebrate! It was a shock to find out at the end of December 2014 when we found out that the price of the offshore partner visa (100/309) was doubling on the 1st January 2015 and that our fee would be just below $4,630! Fast forward to May 2015 when we were almost ready to apply and I was reading the new budget where I discovered that from July 1 2015 the visa fee was going up again to £6,685. Luckily we were eligible to apply before that date, submitting our application at the end of May. The total fees we paid were £2,413 (approx $4,630) for the visa fee, a medical fee of £260 (approx $530) and police check which cost £45 (approx $92). Whilst it was expensive we knew it was worth it to be able to begin our lives together in Australia! When we initially applied we had the option of applying online or applying with a paper application. I initially wanted to apply by paper and send away a big, organised stack of documents but Dan persuaded me to opt for the online application after reading the benefits of it it a number of online forums. Once you have created your account and paid the visa fee on the Department of Immigration and Border Protection’s online services (known as your ImmiAccount) it is quite simple to upload your evidence. Applying online also means that you don’t have to have all your documents certified and you can just upload colour copies of documents (which trust me will save a lot of time, hassle and cost)! It also means that if your case officer has to contact you with questions or requires you to send in additional evidence to support your case you can simply upload it online rather than extending your wait time even more by sending it in by post. Once you create your account and pay the visa fee your ImmiAccount opens up and you have two weeks to submit all your evidence. We didn’t want to waste any time or cause any additional stress so ensured that we had all our evidence ready to submit within a few days of applying. Early on we did think about using a migration agent because the visa was so important to our future and we didn’t want to risk it but we decided against it and now we cannot believe we actually spent time considering this. Our case is quite a simple one, we met all the criteria. had not been apart at all during our de facto relationship and we had no dependents (family or children) that we were trying to migrate to Australia with. I think unless your case is complicated, you have dependents or aren’t sure if you meet the criteria then you can probably do it on your own. I found the whole visa process was quite overwhelming initially and the biggest part was compiling all our evidence! We spent many nights with about a million piles of paper covered in post its and labels spread across our living room floor. For months we spent a few nights a week and hours each weekend researching, writing statements, compiling evidence to support our application, scanning all our evidence and finally applying and uploading our application to our ImmiAccount. I had a few mini breakdowns during the process thanks to my OCD and it was lucky that Dan is so calm & methodical! Once you are ready to upload your documents and evidence online you will see what I mean. There is no clear cut section or heading in which to upload documents as a lot of the evidence falls into numerous categories. In the end we uploaded documents where we felt they were most relevant. We also only uploaded evidence once even if they were suitable for more than one heading/category! There was a lot of headings that weren’t relevant to us so I just left them and didn’t upload anything to them. We also scanned all documents in colour and clearly labelled the documents as to what they were and gave a detailed description on ImmiAccount as to what the document/evidence was to ensure there was no confusion and especially because you can’t expect your case officer to be a mind reader so make it as clear as possible. We uploaded the majority of our evidence to Dan’s application, and only minimal to mine as Sponsor. I’ve broken down all the evidence we submitted below into the categories where we uploaded them. I don’t think there’s a right or wrong way to do it but this is just how we did it! Certified copy Simone’s Birth Certificate. Certified copy Simone’s Drivers Licence. 2 x Recent Passport Photos for Simone. Simone’s Statement on History & Development of Relationship. (We wrote these separately and they were simply typed onto blank A4 paper which we then signed and dated at the bottom before scanning uploading. We did a lot of research before we wrote these and found everyone on forums had done different things, some people’s statements were 1 page and some were more like ours. Some people also did them as Stat Dec’s whilst some just did statements. My statement was about 12 pages long and Dan’s was about 10. We wanted to include as much detailed information in our statements as we could and not leave anything out). Recent Photo of Dan (not passport photo). We uploaded 7 Form 888 Stat Dec’s from 3 family members and 4 friends in Australia. All were witnessed and had certified, colour copies of their passports attached. Correspondence addressed to both of us at the first address we lived together at. Correspondence addressed to both of us at our current address. Utility bills in both our names (Water, Gas, Electric, Council Tax, Car Insurance, Sky TV). Dan’s Statement on History & Development of Relationship. Engagement Documents – Ring Receipt, Cards, Well Wishes, Facebook Update & Comments from friends and family. Flight Centre Invoice – Evidence of Joint Travel – Aug/Sept 2015 to Australia to visit family/friends & attend Simone’s brothers wedding at the Gold Coast. Photographs together travelling & with each other’s families & friends (incl when our families met each other in the UK in May 2015). Joint written statement about the financial aspects of our relationship (typed on blank A4 paper & signed by both of us and dated). Australian Statutory Declarations from Simone’s parents in Australia detailing their ability to provide future financial and living support in Australia if required. Joint statement of the social aspects of our relationship (typed on blank A4 paper & signed by both of us and dated). Cards sent to us as a couple from friends & family. Extensive evidence of Joint Travel (tickets, bookings, flights etc). Travel Evidence & Tickets from trip to Ireland with Simone’s parents. Both our Oyster Cards for travel in London. Joint Social Invitations & Evidence (wedding/birthday invites etc). Six (three family/three friends) additional declarations on Form 888 by non-Australian friends & family supporting the relationship and our application. (Despite them not being official stat decs, we still thought it would be easier for our family and friends to fill them out using this form as guidance. They were still witnessed by qualified people and they also provided certified coloured copies of their passports). Joint statement of the nature of our commitment to each other inclusive of plans for the future (typed on blank A4 paper & signed by both of us and dated). Screenshot Simone work HR system showing Dan as Simone’s emergency contact. NHS (National Health Service) Emergency Contact Wallet cards showing each other as emergency contact. Screenshots from our joint travel Blog/website which we both own & run. Joint statement of the nature of the household (typed on blank A4 paper & signed by both of us and dated). Proof of de facto relationship & shared accommodation for 12 months in the form of 3x Leases. Application Cover Letter (not necessary but we just wrote a one page letter introducing ourselves, our relationship and asking our case officer to get in contact if they required any further at any information at any stage from us). Early Evidence of relationship (hotel bookings in South America, Simone’s UK Visa application, approval and certified copy visa showing arrival date in UK & flights to UK showing date de facto relationship officially began). Whilst we were never apart during our de facto relationship we were after our relationship initially began for six months so we uploaded a selection of screenshots from Facebook chat between us whilst we were apart, and also advised that we could provide more if requested. Dan’s ACRO UK Police Clearance Certificate. Evidence health examination completed and submitted to the department from e-Medical. We visited Australia in August/September for three weeks to see family & friends and attend Simone’s brothers wedding. Prior to leaving we uploaded a document with Dan’s electronic visitor visa confirmation, our flight tickets and contact details whilst we were away. We received a letter (by email) from the Department of Immigration and Border Protection on the 9th July (almost six weeks after we had initially applied) advising us of our case officer. The letter gave detailed information on the visa process including information about the medical and police check, again stated the visa wait as 10-14 months and explained that our case officer and the department would only be in contact if they required further information from us in relation to our application. We didn’t hear from our case officer until our visa was granted in December. Quite a few cases we read about on a number of forums had been required to produce additional evidence which only delayed their visa approval so we were glad we had provided such detailed, comprehensive information for our visa application. In our letter we received from the department advising us we had been assigned a case officer we were advised to arrange our medical and police checks for after November in 2015. Dan booked his a little early in late November as we were away a lot in December and we had the results within a week. We also applied for the police check in early December and had those results back within a fortnight. FINAL TIPS, ADVICE & THINGS WE WISH WE HAD KNOWN BEFORE APPLYING! Start early and don’t underestimate just how time consuming the visa application is. We worked on a few nights a week and hours each weekend for months leading up to applying. SAVE EVERYTHING! I am a little bit of a horder & pretty organised buuuut there is so many things I thought “Damn, I wish I didn’t throw away that bill, or that envelope addressed to both of us, those ticket stubs or invites, or plane tickets”. We looked into the visa in the early days but not seriously until the months leading up to applying and we are honestly lucky that we did have a fairly good filing system for keeping and organising our documentation and weren’t the type to throw away letters, bills etc! You can only upload a maximum of 60 documents on your ImmiAccount, and as far as I am aware they are fairly strict with this. We were sure to collate as many documents together as possible such as all our Bank statements in one document, all Australian Stat Decs as one document, all leases as one document, all evidence of joint travel as one document etc. Scan and upload documents in colour wherever possible! As we mentioned before a huge bonus of the online applications is that if you upload scanned coloured copies of documents you don’t have to have them certified. Having documents certified isn’t a problem in Australia where a JP will do it for free but here in the UK (or most other countries) you are charged for this service! We only had passports/identity documents certified and ensured that our family and friends who did Stat Dec’s for us had them witnessed & also provided us a coloured, certified copy of their passport. A lot of cases we read about online had their case officer had contacted them asking them to provide further information or evidence. 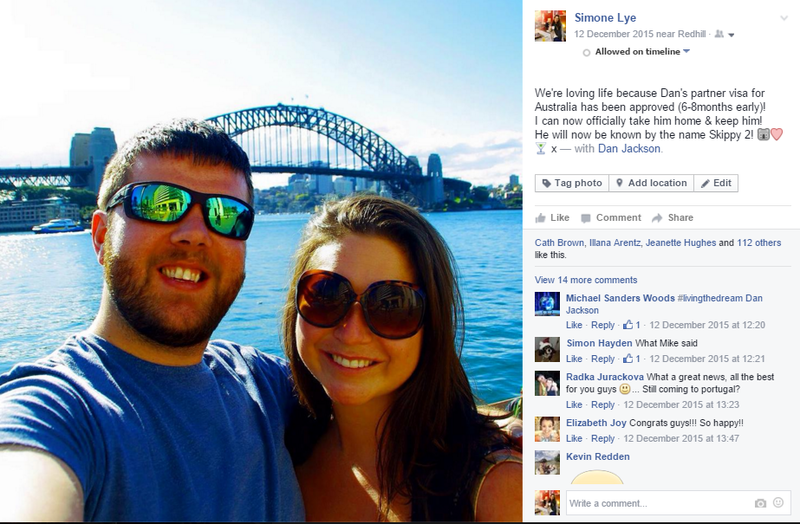 We were lucky enough to not and I am glad we didn’t because it can delay your visa approval even longer! In hindsight we probably submitted a little too much – I’m sure our case officer got sick of looking at all the photos, facebook screenshots and extensive evidence we submitted but we thought it was better safe than sorry! We also read a lot leading up to applying on online forums as we found our fellow applicants to be super helpful in answering questions and sharing their visa experiences. We found both Poms in Oz and Australia Forum to be the most useful to us. We found it really helpful to read stories by people who were going through the same experience as us. We were really lucky to have our visa approved in six months and we think a huge part of that was because our application was so organised, thorough and extensively supported through the evidence we supplied our case officer. We didn’t leave anything up to chance or any question unanswered and ensured our case officer knew we were more than happy to supply any addition evidence if required. We literally couldn’t be more happy that Dan’s visa has been approved! We are over the moon and cannot wait to move to Australia in July this year and start our life there. We can’t wait to work on our careers, plan our wedding, start saving for a house and go to the beach everyday! DISCLAIMER: We are by no means migration agents or legal professionals, just two people who have been through the process and wanting to share our experience to hopefully help others. Please don’t rely on our information alone, we don’t hold any responsibility if it is not factually correct (as it is just based on our own personal experience), or if dates, prices or requirements change.